Resume Link is my latest idea. And for once, I’m actually afraid someone might steal it. Maybe because it’s so easy to do, or maybe it’s that good. Or maybe I’m just desperate & paranoid. The main idea is that you upload your resume and we host it for you. Like photobucket for resumes. We can convert it to any format you want: DOC, PDF, HTML, plain text, etc. We then parse it like the major job sites do and try to get things like Work History, Skills, Contact Information, etc. automatically and put it into a database. Of course we’ll mistakes, so you can review it and correct it. Alternately, you can just build a resume from scratch, and then pick a template. You can change templates & layout at any time and have different templates for online vs. printing. Then we give you a personalized URL like http://resumelink.org/aaronevans and try to SEO it so that a google search for “aaron evans resume” comes to your link. Of course you could just get the link and point it to your existing online resume somewhere else too. Like tinyurl for your resume. You then have an easy to remember link that you can put on your business card and give to people online or over the phone. With this URL, you can track how many times it’s seen, by who, when, and where they came from. With a premium service you can have multiple inbound links for tracking so you know everyone who saw or downloaded your resume that came from a particular recruiter for instance. You can also create a profile to manage your resume or multiple versions of it. You can use your resumelink profile to associate your online resume with your total online presence: facebook, twitter, linkedin, etc. You can limit it to principals or agencies and restrict who can see or download your resume. Things like sharing references and contact information can be controlled too. You can see stats and get messages from others. You can track your job leads and who you’ve sent your resume to. You can refer jobs to other people. You give and receive feedback on resumes. Resume writing consultants and template designers can show off their expertise, and we might have revenue sharing deals with them. Our goal is to be at the top of the search for terms like ‘online resume’ and ‘resume builder’. We’ll put advertising on the site — targeted ad words and direct marketed of banners. I picked resumes because it’s a broad field, especially in these times when so many people are looking for work. It has quite a lot of value as a search term and good adsense relevance. People will be looking for job listings, resume writing services, etc. We’ll also sell tools for employers and agencies to help them find candidates, but we’ll keep people in charge of their resumes. Hopefully, by being the best, they’ll trust us to share their information, and at the very least, they’ll have the traffic filtered through our site so the don’t end up with resume spam. Hopefully, we can do better than that and do a better job of connecting the right employers with the right candidates, but this won’t be a job site, just a resume site. Last week I started working on a test case management tool for my current work. I decided to build it as a plugin for Redmine, an open source project management application, which is based on Ruby on Rails. There seems to be quite a bit of interest in the community, and I hope I can leverage that to get help developing it — that’s the real point of open source anyway, isn’t it? I’m moving slowly, working on it in my spare time. I’m deliberately keeping the feature set small in order to get something useful out there, get feedback, and let it evolve into the product that has the most use for the most people, with my own personal needs coming first, of course. The first challenge is learning how to create a Redmine plugin, which I think I’m starting to turn the corner on. Next will be learning Rails well enough to take advantage of its features and have a code base that others can understand. I think I’ve got a pretty good basic model of TestCases, TestSuites, TestRuns, TestResults, and TestReports. I have an idea for the UI as well, but could really use help on that. Associate test cases to a project. I’ll work on getting a clean repository up (if there’s interest) on Github, Rubyforge, Sourceforge, or my own SVN repo. I hope to have a very basic version 1 within a month or so. Quix is a way to call bookmarklets from a bookmarket. 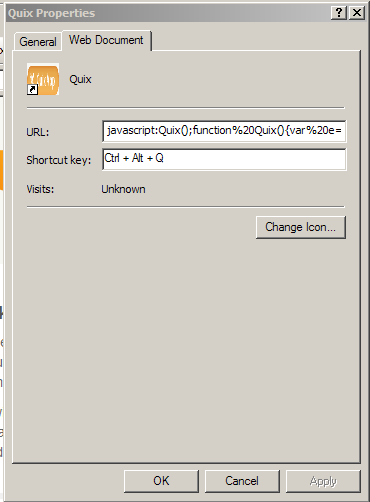 Now you can use the Quix bookmarklet from IE! 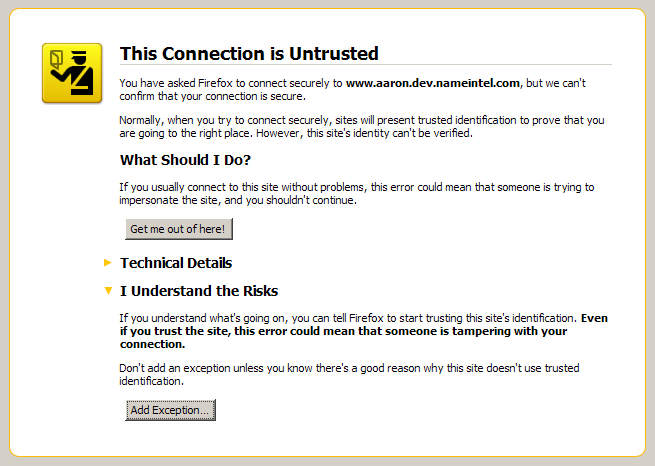 A common problem many Selenium users run into is the untrusted connection warning. There, now don’t you feel safer for all that clicking. 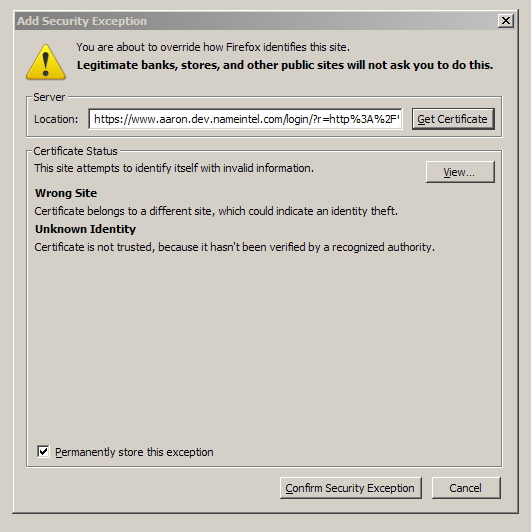 Earlier releases of Firefox 3.5 had a bug that it wouldn’t “permanently” store the SSL Certificate, and there was even a plugin created to fix that. 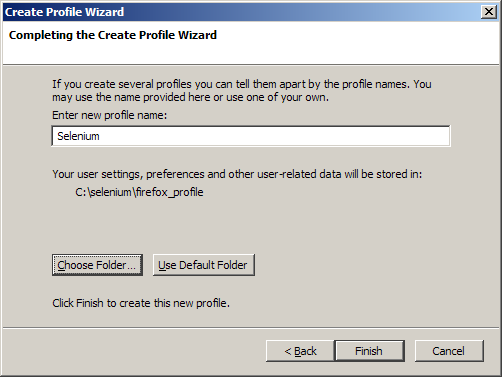 java -jar selenium-server.jar -firefoxProfileTemplate  "c:\Documents and Settings\Aaron Evans\Application Data\Mozilla\Firefox\Profiles\5rdxety0.default"
If you’ve already dismissed the dire warnings manually with your existing profile, now Selenium will sail right through. But only if you use Firefox. 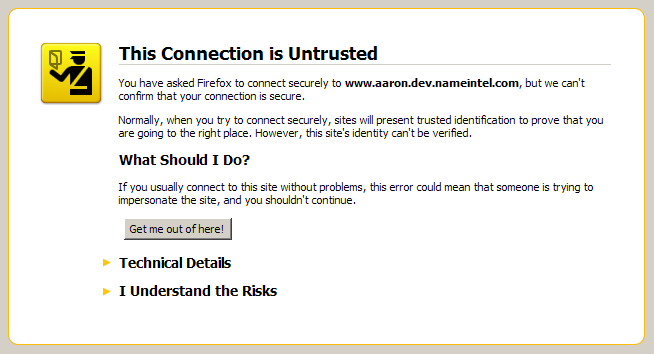 I’ll tell you how to get past this problem with IE, Opera, Chrome, and Safari another day. 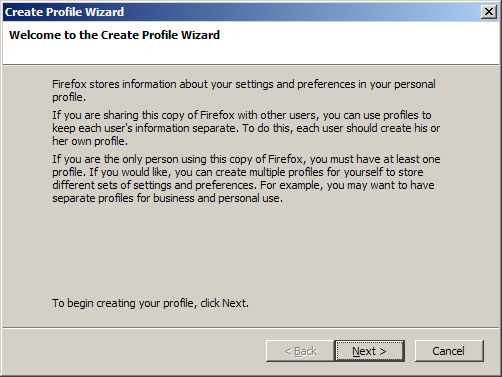 But first, let’s create a custom profile that doesn’t have all the junk you’ve loaded into Firefox (like vimperator and firebug) to make it run a bit quicker and cleaner. Now click through and accept all the SSL certificates on the site you need to run Selenium tests on, repeating the process described above. 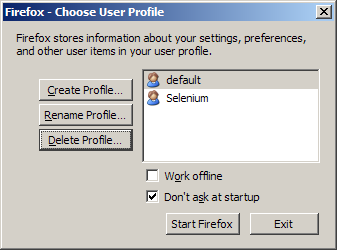 You can do a bunch of other cool stuff with your firefox profile for selenium, but we’ll talk about that later. I’m eager to hear what others have done as well.